Race and ethnicity in the United States Census | Strike of Lightning! Racial profiling in Florida schools! Asian students should be the smartest, and teachers will expect the least from blacks. That’s the case in Florida, at least, where the Board of Education has agreed to pass a revised plan that outlines new academic goals for students based on race. The Florida Board of Education passed the plan last week and hopes to have students across the state meeting the newly created goals by 2018. And while educators are hoping to have higher test scores coming in across the board, race and ethnicity play a deciding factor in what’s expected from Sunshine State students in the years to come. Under the approved strategic revision, 90 percent of Asian students, 88 percent of whites, 81 percent of Hispanics and 74 percent of blacks will be expected to read at or above their applicable reading grade levels in future tests. For math scores, they expect 92 percent of Asians, 80 percent of Hispanics and 74 percent of blacks to excel, suggesting that some races warrant a lower bar than others. Cheryl Etters, a spokesperson for the Florida Department of Education, defends the approved plan, however, and says the decision was made so as to set “realistic and attainable” goals. Is this new law “Racial profiling” or Discrimination against the whites? According to test scores taken from the 2011-2012 state FCAT reading exam, 69 percent of white students scored at or above grade level, while only 38 percent of blacks and 53 percent of Hispanics scored similarly. Despite previous scores suggesting that students from some backgrounds are more likely to excel in tests than others, though, using race as a factor in establishing goals is raising opposition across Florida and the rest of the United States. Juan Lopez, a magnet coordinator at Riviera Beach, Florida’s predominantly black John F. Kennedy Middle School joins Amundson in opposition and tells the Sentinel that he thinks the maneuver is unfair, to say the least. JFK has a black student population of around 88 percent, leaving only around one-sixth of the student body to be stuck with studying more. Florida Department of Ed Chairperson Kathleen Shanahan tells reporters that the revision is being made to help comply with the terms included in a waiver that Florida and nearly three dozen other states have within provisions of the No Child Left Behind Act, the President George W. Bush-approved legislation that allocated federal funding to public schools that takes into account test scores. “We feel that it’s very, very important to have these goals so that we can draw attention to where our students are now, where each of the subgroups are so that schools and parents and teachers can all focus on where we are and where we need to be eventually,” Interim Education Commissioner Pam Stewart tells The Examiner in support of the revisions. The Examiner notes that former Florida Governor Jeb Bush wrote an editorial in the Washington Times only last month calling into question similar benchmarks in Virginia. “Schools’ expectations should be color blind. As a nation, we have rejected police use of racial profiling on the streets, by what rational do we now accept it from educators in the classroom,” Gov. Bush wrote. Races in the United States; All Americans? Everyone needs to understand, where we come from and what it means; when we talk about races in the United States. We are a diverse species of human beings, and we migrated from all over the world to form the United States of America. So if you don’t know this, then you should take 5 minutes and read this brief summary of where we come from and what Race means to the literate persons walking the streets of the USA! American culture is a Western culture, having been originally influenced by European cultures. It has been developing since long before the United States became a country with its own unique social and cultural characteristics such as dialect, music, arts, social habits, cuisine, and folklore. Today, the United States of America is an ethnically and racially diverse country as result of large-scale immigration from many different countries throughout its history Its chief early influences came from English and Irish settlers of colonial America. British culture, due to colonial ties with Britain that spread the English language, legal system and other cultural inheritances, had a formative influence. Other important influences came from other parts of western Europe, especially Germany, France, and Italy. 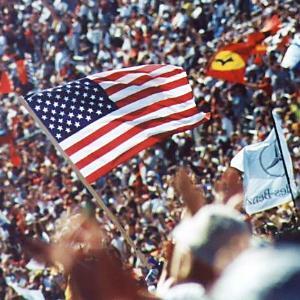 Race in the United States is based on physical characteristics and skin color and has played an essential part in shaping American society even before the nation’s conception. Until the civil rights movement of the 1960s, racial minorities in the United States faced discrimination and social as well as economic marginalization. Today the U.S. Department of Commerce‘s Bureau of the Census recognizes four races, Native American or American Indian, African American, Asian and White (European American). 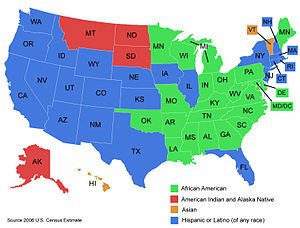 According to the U.S. government, Hispanic Americans do not constitute a race, but rather an ethnic group. During the 2000 U.S. Census Whites made up 75.1% of the population with those being Hispanic or Latino constituting the nation’s prevalent minority with 12.5% of the population. African Americans made up 12.3% of the total population, 3.6% were Asian American and 0.7% were Native American. Until the Thirteenth Amendment to the United States Constitution was ratified on December 6th 1865 the United States was a slave society. While the northern states had outlawed slavery in their territory in the late 18th and early 19th century their industrial economies relied on the raw materials produced by slave labor. Following the Reconstruction period in the 1870s, Southern states initialized an apartheid regulated by Jim Crow laws that provided for legal segregation. Lynching occurred throughout the U.S. until the 1930s, continuing well into the civil rights movement in the South. Asian Americans were also marginalized during much of U.S. history. Between 1882 and 1943 the United States government instituted the Chinese Exclusion Act which prohibited Chinese immigrants from entering the nation. During the Second World War roughly 120,000 Japanese Americans, 62% of whom were U.S. citizens, were imprisoned in Japanese internment camps. Hispanic Americans also faced segregation and other types of discrimination; they were regularly subject to second class citizen status, in practice if not by law. Largely as a result of being de jure or de facto excluded and marginalized from so-called mainstream society, racial minorities in the United States developed their own unique sub-cultures. During the 1920s for example, Harlem, New York became home to the Harlem Renaissance. Music styles such as Jazz, Blues and Rap, Rock and roll as well as numerous folk-songs such as Blue Tail Fly (Jimmy Crack Corn) originated within the realms of African American culture. Chinatowns can be found in many cities across the nation and Asian cuisine has become a common staple in America. The Hispanic community has also had a dramatic impact on American culture. Today, Catholics are the largest religious denomination in the United States and out-number Protestants in the South-west and California. Mariachi music and Mexican cuisine are commonly found throughout the Southwest, with some Latin dishes such as burritos and tacos found anywhere in the nation. Economic discrepancies and de-facto segregation, however, continue and is a prominent feature of mundane life in the United States. While Asian Americans have prospered and have a median household income and educational attainment far exceeding that of Whites, the same cannot be said for the other racial minorities. African Americans, Hispanics and Native Americans have considerably lower income and education than do White Americans. In 2005 the median household income of Whites was 62.5% higher than that of African American, nearly one-quarter of whom live below the poverty line. Furthermore 46.9% of homicide victims in the United States are African American indicating the many severe socio-economic problems African Americans and minorities in general continue to face in the twenty-first century. The prevailing idea in American culture, perpetuated by the media, has been that black features are less attractive or desirable than white features. The idea that blackness was ugly was highly damaging to the psyche of African Americans, manifesting itself as internalized racism. In the 1960s, the Black is Beautiful cultural movement sought to dispel this notion. American attitudes towards drugs and alcoholic beverages have evolved considerably throughout the country’s history. In the 19th century, alcohol was readily available and consumed, and no laws restricted the use of other drugs. Attitudes on drug addiction started to change, resulting in the Harrison Act which eventually became proscriptive. A movement to ban alcoholic beverages, called the Temperance movement, emerged in the late 19th century. Several American Protestant religious groups, as well as women’s groups such as the Women’s Christian Temperance Union, supported the movement. In 1919, Prohibitionists succeeded in amending the Constitution to prohibit the sale of alcohol. Although the Prohibition period did result in lowering alcohol consumption overall, banning alcohol outright proved to be unworkable, as the previously legitimate distillery industry was replaced by criminal gangs which trafficked in alcohol. Prohibition was repealed in 1931. States and localities retained the right to remain “dry”, and to this day, a handful still do. During the Vietnam War era, attitudes swung well away from prohibition. Commentators noted that an 18 year old could be drafted to war but could not buy a beer. Most states lowered the legal drinking age to 18. Since 1980, the trend has been toward greater restrictions on alcohol and drug use. The focus this time, however, has been to criminalize behaviors associated with alcohol, rather than attempt to prohibit consumption outright. New York was the first state to enact tough drunk-driving laws in 1980; since then all other states have followed suit. A “Just Say No to Drugs” movement replaced the more libertine ethos of the 1960s. As a result, since the late half of the 1980’s to about the year 2000, all states made the legal drinking age (to purchase alcoholic beverages) at 21.